The StylPro is a makeup brush cleaner that was developed for professional make-up artists by BBC Apprentice winner Tom Pellereau. The StylPro is brilliant because it cleans and dries makeup brushes in seconds. The StylPro makeup brush cleaner uses centrifugal spin technology to clean and dry makeup brushes in less than 30 seconds. It is very easy to use and allows you to use your brushes straight after cleaning them. When I have cleaned my makeup brushes in the past I have had to wait at least 24 hours to use them again as they were still wet. The StylPro not only cleans your brushes quickly but also dries them which is great. The StylPro includes 8 flexible silicone collars to attach your make up brushes to. There are 8 sizes available so you can clean different sized brushes. The sizes of the silicone collars are: 30mm, 24mm, 19mm, 15mm, 11mm, 9mm, 7mm, 5mm. It also includes a Tritan bowl, a collar stand, a StylPro device and 2 x 10ml StylPro makeup brush cleanser sachets. To use the StylPro you simply attach your makeup brush to the appropriate collar and then attach it to the StylPro Device. If you are cleaning brushes which have oil based make up on them StylPro advise to use the cleanser sachets, but if you are cleaning brushes with powder based makeup on then soap and water will be fine. To use the StylPro you pour the cleanser/soap and water solution into the bowl and attach the bowl neck. 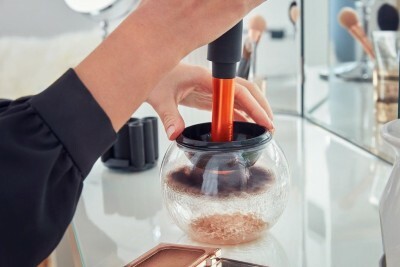 You then just put the makeup brush attached to the collar and StylPro device in the bowl and press the button on the StylPro device to make the brush spin which cleanses it thoroughly. Then if you slightly lift the brush out of the solution and then press the button, the makeup brush spins so it drie. You can use the cleansed and dried makeup brush straight away. When I used the StylPro I was surprised how quickly and easily it cleaned my brushes. I think it’s a brilliant device and using it will definitely encourage me to clean my makeup brushes more often. The StylPro requires 2 x AAA batteries and the RRP is £49.99. It is available from styltom.co.uk.